Following along the new profile path, the redesigned Pages also incorporates the new layout of tagged photos and photo albums directly under the artist’s or public figure’s name. All of these changes were expected because of the transition towards the new profile a couple of months ago. 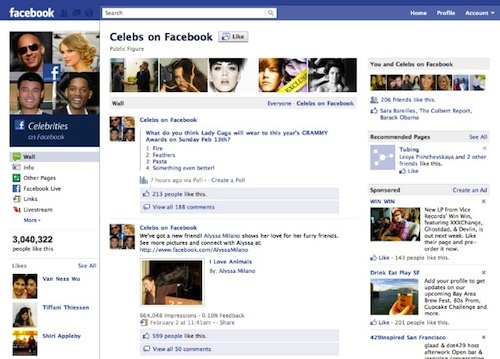 However, there are some distinct differences and features of the new Facebook Pages. One being that now, admins are given the option to “Login as a Page,” meaning that they can interact with their fans or clients much more directly. The admin’s news feed will also showcase “the most important news from the Pages you’ve ‘like’” (Mashable, February 11). The “Everyone” feature” on the page’s wall also includes this new element of highlighting the posts that have the most “likes” or comments. You can however, switch from the “Everyone” filter to just simply clicking on the name of the page to view the status updates, notes, event updates, etc. from just that artist or public figure. While an admin can also act as an individual by the “logging in as a page” element, they are still restricted to only commenting and “liking” particular user’s who have the “everybody” setting in their privacy section. Being under the alias of their Pages however, allows for much more enhanced marketing techniques and strategies. It enables admins to become even more involved with their client’s fans, as well as providing them with updates at a much more rapid pace. To finish off this tour of the new Facebook Pages structure, is the top right-hand section of Pages, which includes similar aspects of a user’s profile by indicating mutual friends who “like” the Page you are looking at, and as an admin, the right-hand section displays all of the other admins, (if you choose to have this feature) with suggestions to further marketing strategies and promoting of your Page. From a marketing perspective, the new Pages definitely has several new strategies to offer. Having the ability to be under the Facebook Page’s alias as an admin is a wonderful new feature that can allow for a much more direct connection with fans and clients. Although the new profile’s redesign allowed for things to appear more organized, this new structure may not translate well for the Page’s feature. The thick and bold tabs placed at the top of the page that indicated a photos section, videos section, etc., was very easy to navigate within the old Pages. This new format for Pages may take some getting used to for fans and admins. The “Everyone” feature may also contain some flaws. Although it is important to see which posts are receiving the most “likes” and/or comments, this does not necessarily mark them as the most significant or crucial posts within the news feed. As a marketing strategy it is understandable why Facebook would integrate this element, however, it may not aid admins in the long run. Just as the new profile started off with a preview, allowing users to sample the new profile before making it mandatory, the new Facebook Pages are offering the same option. Admins can currently choose whether to upgrade their Pages or not, but on March 10 the change becomes fixed! Mosey on over to your Facebook Pages to preview the upcoming new Pages and get a feel for the new format and features yourself!